Margin calls are triggered when investors borrow funds to invest in a stock and then see that stock fall in price. In order to maintain the margin of their loan, they must re-invest in the stock. A failure to do so within 24 hours of the margin call will lead to the stock being sold at the lowered price. While this concept is usually reserved for the stock market, Macron seems to be facing a very similar situation. Throughout his campaign and presidency, he has asked the French people to buy into his long term vision for the resurgence of France, which require non-negligible sacrifices on the part of the population. While French people have mostly bought into his vision, the strain that this process has created on France’s working class has recently triggered a margin call: Macron needs to re-invest in the needs and worries of the working class or risks losing them and France altogether. Following a successful first year in office, President Emmanuel Macron planned to further advance his reform of the French economy. With the heroics of the French national team during the World Cup, it seemed to be a year where France could do no wrong. In reality, 2018 turned out to be a particularly trying year for the young President. After successfully dealing with union-led protests against his loosening of labor-market regulations earlier in the year, Macron received his first margin call. The combination of scrapping the wealth tax in 2017, which taxed the richest 0.9% of French society, and proposing a diesel and petrol tax for the 2019 budget, which largely impacted lower-middle class families, generated an explosive reaction from the French people: Gilets Jaunes protestors quite literally set the country ablaze. During his campaign and the early days of his presidency, some pointed to Macron’s privileged background and called him “Le president des riches”. In recent months, the quick succession of Macron’s political reforms to reboot the economy, and shift France towards a greener economy, have made this perception increasingly popular. More than ever before, Macron is perceived as the “president of the rich” and having lost touch with the immediate worries and struggles of the working class. Although he was elected on a decidedly ‘centrist’ platform, with support coming from both sides of the political spectrum, many have criticized his recent policies for disproportionately favouring the more privileged strata of French society. Macron’s eagerness to reboot the economy has caused many of his constituents to perceive his pro-business stance to be his most defining one. While he has been incredibly successful in this endeavour – with the dynamism that the French economy is experiencing being labeled as the “Macron Effect” – the speed at which he has attempted to turn the economy around has been difficult to withstand for many middle-income families. This has caused some of his most loyal allies, like long time centrist François Bayrou, to ask him to become a more equitable president. His opponents have even gone further in their critique of his business-friendly policies, stating that “he is waging war on the poor”. A December survey published in L’Obs has found that 74% of French people felt the label “president of the rich” was accurate for Macron, and the last year has seen his approval rating drop over 40%. While many analysts are incredibly hopeful in regards to the economic future of France, President Macron seems to have underestimated the immediate and pressing struggles of the French working class. This miscalculation was most visible with the popular response to Macron’s diesel tax, in the form of the Gilets Jaunes protests. 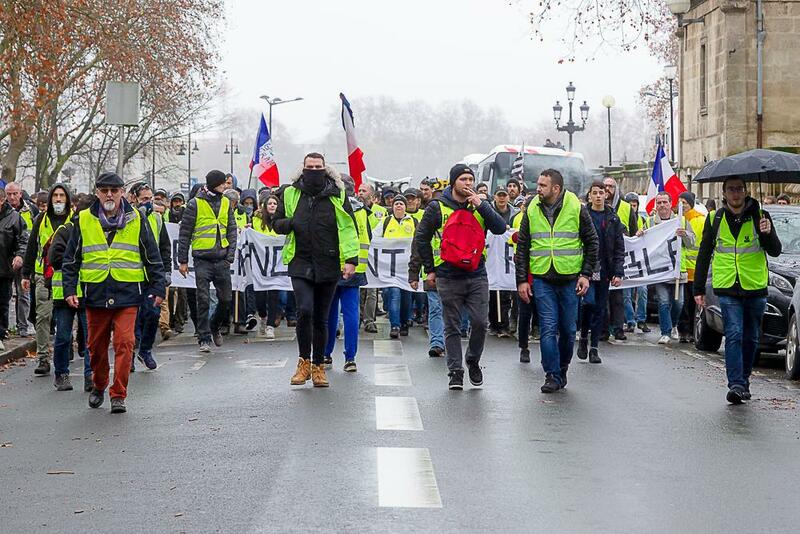 While this movement was not as organized and as defined as the previous organized protests that Macron successfully handled, it effectively represented the worries and struggles of this much larger group of people. President Macron and his office failed to account for this difference in the early days of the protest, and the demonstrations that ensued over the following weeks brought to light just how much some groups in France had been struggling in Macron’s new economy. What started with a woman’s online video criticizing Macron’s diesel-tax, rapidly transformed into a nation wide crisis that crippled France’s access roads and main arteries for weeks. Although violent protests are usually reserved for young politically active students, a non-negligible part of the Gilets Jaunes movement are the lower-middle class parents and retirees, who are worried about making ends meet in a seemingly solely pro-business economy. In an attempt to break this cycle and perception, President Macron has launched Le Grand Débat, a series of debates which will happen all over France during the next few months, to give a platform for people to air their grievances. While this might work, some are pessimistic, believing that the ‘Great Debate’ is simply a red herring on the part of Macron to appease protestors long enough for them to lose momentum and the will to protest. Macron seems determined to prove these critics wrong, having already taken part in three debates where he faced the harrowing questions of local politicians and constituents alike for hours on end. When he initially announced Le Grand Débat and the scrapping of the diesel-tax in a speech on December 10th, President Macron also outlined multiple measures that he would undertake to ensure that all French people immediately benefitted from France’s economic turn around. First and foremost, he guaranteed that the minimum wage, the SMIC, would be increased by 100 euros each month at no cost for employers. This reform is an important one, not solely on a social level, but on a political one, seeing as it demonstrates Macron’s deepened appreciation for the struggle that many French families face in making ends meet. President Macron had previously refused any and all increases to the minimum wage, which his opponent Jean-Luc Mélenchon had pointed to in his criticism that Macron was waging “war on the poor”. This complete shift in stance on the part of President Macron signals what I believe will be a major turning point in his future policies: the importance of short-term benefits for those that cannot afford to wait for the long term ones. While Macron’s valiant attempt to generate momentum within the economy had been working, the Gilets Jaunes crisis represented a valuable margin call:Macron re-invested in the French people and realized that reforms can only move as fast as the majority allows them to. President Macron’s dedication to the economic and environmental futures of France are important and necessary, but in order for his efforts to be successful in the long run, and for those efforts to not lead to a surge of populism, he must ensure that the working class benefits enough in the short run. Without tangible proof that their quality of life is improving in the present, France’s working class will be unable to support reforms which guarantee it will improve in the future, and explosive crises like the one we have just witnessed will become regular occurrences.